We analyze the structure of gaugino interactions on D7-branes from a 10d perspective. This is essential if one wants to lift the standard 4d approach to type IIB moduli stabilization to 10d. In particular, a 10d picture has recently been used to raise concerns about the KKLT proposal for constructing de Sitter vacua, and to lend support to swampland conjectures against de Sitter. However, the analyses of brane gaugino condensation so far are plagued by UV divergences and do not include local 4-fermion terms. They also fail to reproduce the 4-fermion terms required by supergravity when compactified to four dimensions. Motivated by the structure of heterotic and Hořava-Witten theories, we suggest an extension of the brane action by a particular 4-fermion operator that resolves the above problems. Crucially, the UV divergence is cancelled and the expected structure of the 4d effective action is reproduced. We believe that attempts at a 10d description of KKLT have to be reconsidered in this new light. S. Kachru, R. Kallosh, A.D. Linde and S.P. Trivedi, de Sitter vacua in string theory, Phys. Rev. D 68 (2003) 046005 [hep-th/0301240] [INSPIRE]. E. Silverstein, (A)dS backgrounds from asymmetric orientifolds, Clay Mat. Proc. 1 (2002) 179 [hep-th/0106209] [INSPIRE]. A. Maloney, E. Silverstein and A. Strominger, de Sitter space in noncritical string theory, in The future of theoretical physics and cosmology: Celebrating Stephen Hawking’s 60th birthday. Proceedings, Workshop and Symposium, Cambridge, U.K., January 7-10, 2002, pp. 570-591 (2002) [hep-th/0205316] [INSPIRE]. J. Moritz, A. Retolaza and A. Westphal, Toward de Sitter space from ten dimensions, Phys. Rev. D 97 (2018) 046010 [arXiv:1707.08678] [INSPIRE]. U.H. Danielsson and T. Van Riet, What if string theory has no de Sitter vacua?, Int. J. Mod. Phys. D 27 (2018) 1830007 [arXiv:1804.01120] [INSPIRE]. M. Cicoli, S. De Alwis, A. Maharana, F. Muia and F. Quevedo, de Sitter vs Quintessence in String Theory, Fortsch. Phys. 67 (2019) 1800079 [arXiv:1808.08967] [INSPIRE]. J. Moritz, A. Retolaza and A. Westphal, On uplifts by warped anti-D3-branes, Fortsch. Phys. 67 (2019) 1800098 [arXiv:1809.06618] [INSPIRE]. I. Bena, E. Dudas, M. Graña and S. Lüst, Uplifting Runaways, Fortsch. Phys. 67 (2019) 1800100 [arXiv:1809.06861] [INSPIRE]. R. Kallosh, A. Linde, E. McDonough and M. Scalisi, 4D models of de Sitter uplift, Phys. Rev. D 99 (2019) 046006 [arXiv:1809.09018] [INSPIRE]. F.F. Gautason, V. Van Hemelryck and T. Van Riet, The Tension between 10D Supergravity and dS Uplifts, Fortsch. Phys. 67 (2019) 1800091 [arXiv:1810.08518] [INSPIRE]. J. Armas, N. Nguyen, V. Niarchos, N.A. Obers and T. Van Riet, Meta-stable non-extremal anti-branes, arXiv:1812.01067 [INSPIRE]. G. Obied, H. Ooguri, L. Spodyneiko and C. Vafa, de Sitter Space and the Swampland, arXiv:1806.08362 [INSPIRE]. H. Ooguri, E. Palti, G. Shiu and C. Vafa, Distance and de Sitter Conjectures on the Swampland, Phys. Lett. B 788 (2019) 180 [arXiv:1810.05506] [INSPIRE]. A. Hebecker and T. Wrase, The Asymptotic dS Swampland Conjecture — a Simplified Derivation and a Potential Loophole, Fortsch. Phys. 67 (2019) 1800097 [arXiv:1810.08182] [INSPIRE]. S.K. Garg and C. Krishnan, Bounds on Slow Roll and the de Sitter Swampland, arXiv:1807.05193 [INSPIRE]. P.G. Camara, L.E. Ibáñez and A.M. Uranga, Flux-induced SUSY-breaking soft terms on D7-D3 brane systems, Nucl. Phys. B 708 (2005) 268 [hep-th/0408036] [INSPIRE]. J.M. Maldacena and C. Núñez, Supergravity description of field theories on curved manifolds and a no go theorem, Int. J. Mod. Phys. A 16 (2001) 822 [hep-th/0007018] [INSPIRE]. J.P. Derendinger, L.E. Ibáñez and H.P. Nilles, On the Low-Energy d = 4, N = 1 Supergravity Theory Extracted from the d = 10, N = 1 Superstring, Phys. Lett. 155B (1985) 65 [INSPIRE]. M. Dine, R. Rohm, N. Seiberg and E. Witten, Gluino Condensation in Superstring Models, Phys. Lett. 156B (1985) 55 [INSPIRE]. P. Hořava and E. Witten, Heterotic and type-I string dynamics from eleven-dimensions, Nucl. Phys. B 460 (1996) 506 [hep-th/9510209] [INSPIRE]. P. Hořava and E. Witten, Eleven-dimensional supergravity on a manifold with boundary, Nucl. Phys. B 475 (1996) 94 [hep-th/9603142] [INSPIRE]. P. Hořava, Gluino condensation in strongly coupled heterotic string theory, Phys. Rev. D 54 (1996) 7561 [hep-th/9608019] [INSPIRE]. H.P. Nilles, M. Olechowski and M. Yamaguchi, Supersymmetry breaking and soft terms in M-theory, Phys. Lett. B 415 (1997) 24 [hep-th/9707143] [INSPIRE]. J. Polchinski, Brane/antibrane dynamics and KKLT stability, arXiv:1509.05710 [INSPIRE]. E.A. Mirabelli and M.E. Peskin, Transmission of supersymmetry breaking from a four-dimensional boundary, Phys. Rev. D 58 (1998) 065002 [hep-th/9712214] [INSPIRE]. S.B. 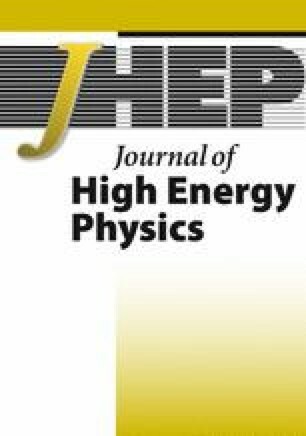 Giddings, S. Kachru and J. Polchinski, Hierarchies from fluxes in string compactifications, Phys. Rev. D 66 (2002) 106006 [hep-th/0105097] [INSPIRE]. J. Wess and J. Bagger, Supersymmetry and supergravity, Princeton University Press, Princeton, NJ, U.S.A. (1992) [INSPIRE]. S. Gukov, C. Vafa and E. Witten, CFT’s from Calabi-Yau four folds, Nucl. Phys. B 584 (2000) 69 [Erratum ibid. B 608 (2001) 477] [hep-th/9906070] [INSPIRE]. 3.Department of PhysicsUniversity of WisconsinMadisonU.S.A.